Continuous delivery is accepted as an enterprise software practice, and is a natural evolution of well-established continuous integration principles. However continuous deployment continues to be notably rare, perhaps due to the complexity of management and the fear of failed deployments impacting system availability. Flagger is an open source Kubernetes operator that aims to untangle this complexity. 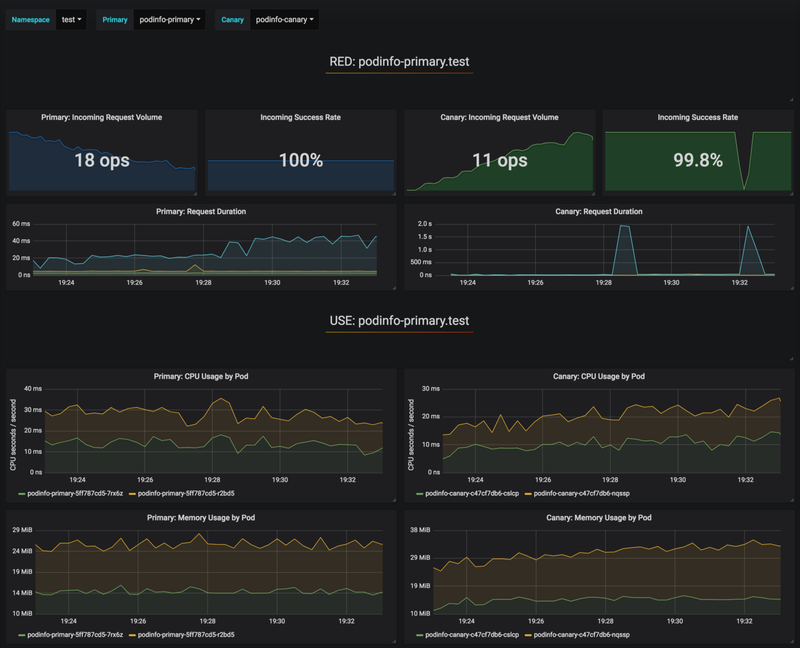 It automates the promotion of canary deployments utilising Istio’s traffic shifting and Prometheus metrics to analyse an application’s behaviour during a controlled rollout. What follows is a step-by-step guide to setting up and using Flagger on Google Kubernetes Engine (GKE). You’ll begin by creating a GKE cluster with the Istio add-on (if you don’t have a GCP account you can sign up here for free credits). Login into Google Cloud, create a project and enable billing for it. Install the gcloud command line utility and configure your project with gcloud init. The above command will create a default node pool consisting of two n1-standard-2 (vCPU: 2, RAM 7.5GB, DISK: 30GB) VMs. Ideally you would want to isolate the Istio components from your workloads but there is no easy way of running the Istio pods on a dedicated node pool. The Istio manifests are considered read-only and GKE will undo any modification like node affinity or pod anti-affinity. Homebrew 2.0 is now also available for Linux. No production system should expose services on the internet without SSL. To secure the Istio ingress gateway with cert-manager, CloudDNS and Let’s Encrypt please read Flagger GKE documentation. The GKE Istio add-on does not include a Prometheus instance that scrapes the Istio telemetry service. Because Flagger uses the Istio HTTP metrics to run the canary analysis you have to deploy the following Prometheus configuration that’s similar to the one that comes with the official Istio Helm chart. You can install Flagger in any namespace as long as it can talk to the Istio Prometheus service on port 9090. Navigate to http://grafana.istio.example.com in your browser and you should be redirected to Grafana’s login page. Flagger takes a Kubernetes deployment and optionally a horizontal pod autoscaler (HPA), then creates a series of objects (Kubernetes deployments, ClusterIP services and Istio virtual services). These objects expose the application on the mesh and drive the canary analysis and promotion. The above analysis, if it succeeds, will run for five minutes while validating the HTTP metrics every half minute. You can determine the minimum time that it takes to validate and promote a canary deployment using the formula: interval * (maxWeight / stepWeight). The Canary CRD fields are documented here. Open your browser and navigate to app.istio.example.com, you should see the version number of the demo app. Flagger implements a control loop that gradually shifts traffic to the canary while measuring key performance indicators like HTTP requests success rate, requests average duration and pod health. Based on analysis of the KPIs a canary is promoted or aborted, and the analysis result is published to Slack. Note that if new changes are applied to the deployment during the canary analysis, Flagger will restart the analysis phase. During the canary analysis it is possible to generate synthetic HTTP 500 errors and high response latency to test if Flagger pauses the rollout. Running a service mesh like Istio on top of Kubernetes gives you automatic metrics, logs, and traces but deployment of workloads still relies on external tooling. Flagger aims to change that by extending Istio with progressive delivery capabilities. Flagger is compatible with any CI/CD solutions made for Kubernetes, and the canary analysis can be easily extended with webhooks for running system integration/acceptance tests, load tests, or any other custom validation. Since Flagger is declarative and reacts to Kubernetes events, it can be used in GitOps pipelines together with Weave Flux or JenkinsX. If you’re using JenkinsX you can install Flagger using the jx addons. Flagger is sponsored by Weaveworks and powers the canary deployments in Weave Cloud. The project is being tested on GKE, EKS and bare metal clusters provisioned with kubeadm. If you have any suggestion on improving Flagger please submit an issue or PR on GitHub at weaveworks/flagger. Contributions are more than welcome!